At 3:33 a.m. EDT on Aug. 11, while most of the U.S. is asleep, NASA's Kennedy Space Center in Florida will be abuzz with excitement. At that moment, NASA's Parker Solar Probe, the agency's historic mission to touch the Sun, will have its first opportunity to lift off. Launching from Cape Canaveral Air Force Station in Florida, Parker Solar Probe will make its journey all the way to the Sun's atmosphere, or corona—closer to the Sun than any spacecraft in history. 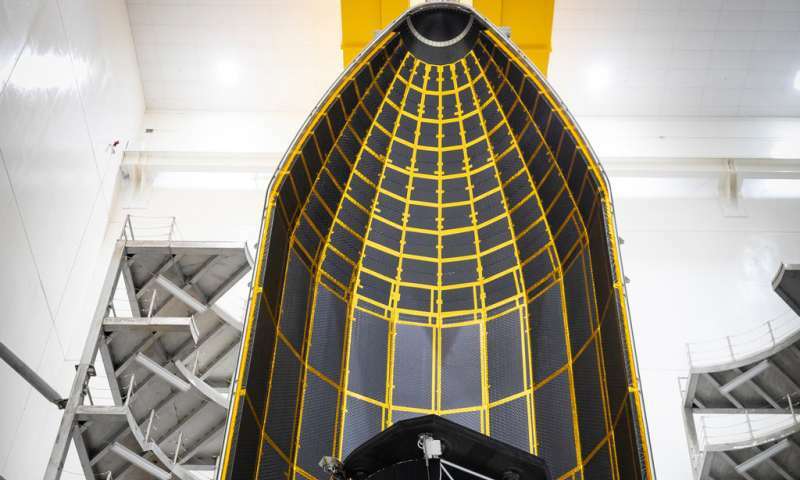 "Eight long years of hard work by countless engineers and scientists is finally paying off," said Adam Szabo, the mission scientist for Parker Solar Probe at NASA's Goddard Space Flight Center in Greenbelt, Maryland. Nestled atop a United Launch Alliance Delta IV Heavy—one of the world's most powerful rockets—with a third stage added, Parker Solar Probe will blast off toward the Sun with a whopping 55 times more energy than is required to reach Mars. About the size of a small car, it weighs a mere 1,400 pounds. "That's a relatively light spacecraft," said Andy Driesman, project manager for the mission at the Johns Hopkins Applied Physics Lab. "And it needs to be, because it takes an immense amount of energy to get to our final orbit around the Sun." Zooming through space in a highly elliptical orbit, Parker Solar Probe will reach speeds up to 430,000 miles per hour—fast enough to get from Philadelphia to Washington, D.C., in a second—setting the record for the fastest spacecraft in history. During its nominal mission lifetime of just under 7 years, Parker Solar Probe will complete 24 orbits of the Sun—reaching within 3.8 million miles of the Sun's surface at closest approach. "We'll be going where no spacecraft has dared go before—within the corona of a star," said project scientist Nicky Fox of APL. "With each orbit, we'll be seeing new regions of the Sun's atmosphere and learning things about stellar mechanics that we've wanted to explore for decades." But getting so close to the Sun requires slowing down—for which Parker will use the gravity of our neighbor planet, Venus. "Parker Solar Probe uses Venus to adjust its course and slow down in order to put the spacecraft on the best trajectory," said Driesman. "We will fly by Venus seven times throughout the mission. Each time we fly by we get closer and closer to the Sun." "NASA was planning to send a mission to the solar corona for decades, however, we did not have the technology that could protect a spacecraft and its instruments from the heat," said Szabo. "Recent advances in materials science gave us the material to fashion a heat shield in front of the spacecraft not only to withstand the extreme heat of the Sun, but to remain cool on the backside." Parker Solar Probe is also the first NASA mission to be named after a living individual: Dr. Eugene Parker, famed solar physicist who in 1958 first predicted the existence of the solar wind, the stream of charged particles and magnetic fields that flow continuously from the Sun, bathing Earth. The spacecraft's path through the corona allows it to observe the acceleration of the very solar wind that Parker predicted, right as it makes a critical transition from slower than the speed of sound to faster than it. The corona is also where the solar material is heated to millions of degrees and where the most extreme events on the Sun occur, such as solar flares and coronal mass ejections—accelerating particles to a fraction of the speed of light. These explosions create space weather events that can pummel Earth with high energy particles, endangering astronauts, interfering with GPS and communications satellites and, at their worst, disrupting our power grid. "All of our data on the corona so far have been remote," said Nicholeen Viall, solar physicist at Goddard. "We have been very creative to get as much as we can out of our data, but there is nothing like actually sticking a probe in the corona to see what's happening there." And scientists aren't the only ones along for the adventure—the spacecraft holds a microchip carrying the names of more than 1.1 million participants who signed up to send their name to the Sun. Sometime between Aug. 11 and 23, the close of the launch period, these names and 1,400 pounds of solar protection and science equipment will begin their journey to the center of our solar system. "For scientists like myself, the reward of the long, hard work will be the unique set of measurements returned by Parker," said Szabo. "The solar corona is one of the last places in the solar system where no spacecraft has visited before. It gives me the sense of excitement of an explorer." Stay tuned—Parker is about to take flight.